Agriogourouno sti gastra (pr. ah-ghree-oh-GHOU-rhou-nho sti GAH-strah), is wild boar cooked in a “gastra” which is a Greek Dutch oven. The meat is marinated and then slowly cooked in the oven. 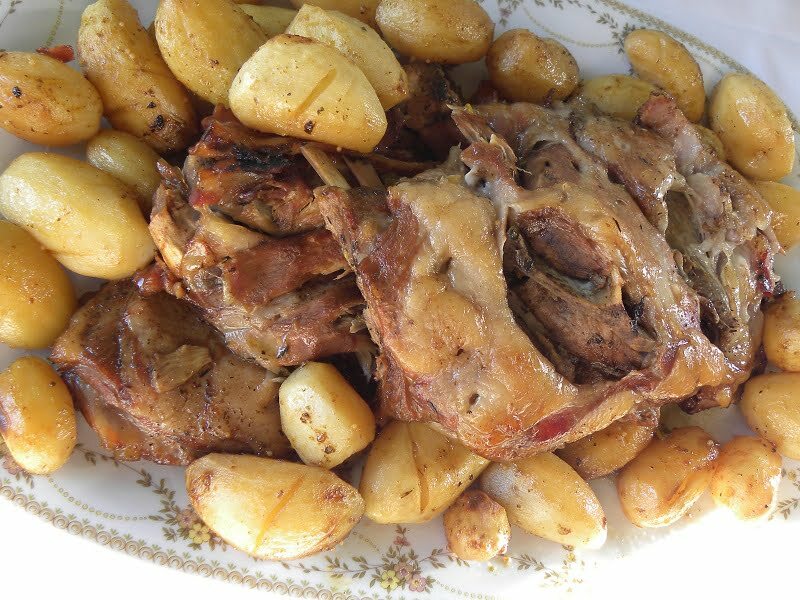 If you live in Northern Greece or if you have a hunter in the family, you might eat wild boar frequently, because there are a lot in the mountains and forests. When I got married and we moved from Cyprus to Greece, my husband, being in the military, was transferred to Rodopolis, Serron in Northern Greece, where we lived at Kato Porroia for three years. There, we used to eat it often because the hunters would keep what they needed (considering that it weighs around 100 – 150 kilos) and the remaining was sold to the local butchers. Although I loved cooking even before I was married, my cooking knowledge was very limited back then because we never cooked wild boar in Cyprus but I did learn from the locals that marinating the meat for a lot of hours (even 2 – 3 days if the boar is very big) makes it tender and succulent and the second thing you have to know it should be slowly cooked for many hours. The wild boar I cooked is farm bred but even this kind we don’t see it often in Athens butcher shops (yes we are lucky and still can get our meat at local butcher shops!! ), as it is usually sold during the Christmas holidays. However, if you can’t find wild boar you can substitute it with pork. Farm bred Wild boar is much tastier than pork and it has less fat than pork but it does not have the strong gamy taste of those living in the wild. I marinated the meat overnight and just followed my instinct on what I though would give a great flavour to the meat. I have a very good instinct on this and it turned out succulent and delicious. I made this recipe during the Christmas holidays of 2009 but I only managed to post it now, two years later. I have made a post on New Year’s day with a list of recipes I intend to post during this year, but unless someone asks me for a specific recipe, like this one, they’ll have to wait as I prefer to post seasonal recipes. In my previous post I wrote about the side dish of the best baked Greek Lemony Potatoes I made to accompany this dish. I cooked it in a “gastra”, a Tupperware Dutch oven, but if you have a different one or a slow cooker, you can adjust the time accordingly. This vessel can take up to 200oC/390oF, so I placed it low in the oven and, after cooking it for 2 hours I placed the Lemony potatoes in a separate dish on top of the lid and they were cooked simultaneously, for one hour and thirty minutes. I’ve been away from blogging for a few days due to back problems and today I was already feeling much better so before finishing this post which I started over a week ago, I wanted to catch up at Facebook. The day began full of pleasant surprises. The first thing was to read some wonderful reviews for my cookbook. Again, I wish to thank all of you who have added the book on your side bar. If you wish to win the cookbook you can still add the book on your blog’s side bar with a link to my blog or if you have already bought the book from Amazon.com and will write a review on your blog or at Amazon.com or if have bought the book from Createspace you can leave your review here, but please leave a message at this post so that you may be entered in the draw at the end of the month. Agriogourouno sti gastra (pr. ah-ghree-oh-GHOU-rhou-nho sti GAH-strah), is wild boar cooked in a "gastra" which is a Greek Dutch oven. Wash the meat and place it in a bowl with all the marinade ingredients and mix. Cover with a lid or plastic wrap and place in the fridge to marinate overnight. In a non stick frying pan sauté the bacon and discard the fat. Place on kitchen paper and then on the bottom of the casserole dish. Preheat the oven to 200oC/390oF. Heat the olive oil in a sautéing pan and sauté the wild boar. Turn on the other side and add the onions, garlic, carrots and celery and sauté for ten minutes. Season with salt and pepper. Add the marinade ingredients and mix for a few minutes. Remove the meat to the "gastra" (casserole dish) and place on top of the bacon and pour on top the remaining ingredients. Cover baking tin with the lid (or use an aluminum tent) and after cooking for 1 hour, reduce heat to 180oC – 350oF and cook for 2 1/2 - 3 more hours. Half way through, turn the meat over. (One and a half hours before it is cooked you can add the lemony potatoes). Remove the broth and allow to cool for a while, keeping the wild boar covered in the casserole, to remain warm. Empty the potato pan drippings in a sauce pan and heat. If it is not enough, add extra olive oil. Add the flour and mix to make a roux. Add the meat stock and cook until the sauce thickens. Taste and season accordinly, if necessary. I did not have time to measure the ingredients for the sauce, so the ingredients given are just a rough estimate. You can use only the broth after straining it or after it has cooled puree what has remained (except the carrot) in a food processor. I'm so glad to have found your blog (via Taste of Beirut by the way). My husband's grandparents came from Cyprus and the dishes she handed down via his Mum are terrific. I'd love to learn more about Greek cookery – especially Cypriat variations. The lemon potatoes are one of favourites. Glad to meet you Sally. I shall visit you soon. Interesting to learn more about wild boar and farmed wild boar. That's so great that you have local butchers! That seems to slowly be coming back here. The closest thing I ever ate was venison and my brother fixed it; it is so interesting to hear about game such as wild boar and how to prepare it. You are welcome Ivy. I had agriogourouno cooked as souvla. This recipe looks far more interesting. Thank you for sharing. Oh, yummy! i ate once wild boar and loved it. Your dish must be very scrumptious. I am sure it melted in your mouth. My cousin is a hunter and brings to us occasionally games. Ivy, this looks Devine! I am rather fascinated by your Tupperware casserole dish – I don’t think they sell those here. My copy of your book arrived this week – can’t wait to try the custard filo dessert. Thank you so much Gaye. I take it that you are referring to Shamishi or galaktoboureko. They are my favourite! Oh, I love boar, but not easy to get around here!! That's a great pot! I have never had wild boar before…but you've definitely got me intrigued as it looks so saucy and delish. Have a great weekend, Ivy! sounds amazingly delicious! I would love to get my hands on some wild boar meat, would love to make lots of dishes with it! I have neither eaten nor prepared agriogourouno before. This sounds like a great winter dish. Je connais surtout le civet de sanglier. Et c'est tellement bon. Je n'ai plus l'occasion d'avoir du sanglier à disposition pour le cuisiner. I wish there were more boar available here because I hear it's so much better for you than beef! This casserole sounds so delicious, especially with that wonderful sauce you've put on it!